The new limited-edition Infiniti Q50 comes with lots of extra equipment as standard. This year marks the 30th anniversary of Infiniti, and to celebrate the luxury automaker is launching a new special edition version of the Q50 sedan. Debuting at the 2019 New York Auto Show next week, the 2019 Infiniti Q50 Signature Edition is distinguished by unique exterior enhancements including sporty front and rear fascias, special Signature Edition trunk badging, and exclusive 19-inch bright-finish Signature Edition alloy wheels. Inside, the Q50 Signature Edition gets Kacchu aluminum trim and leather-appointed sport seats. As standard, the 2019 Q50 Signature Edition includes features typically offered as part of the Essential Package, including heated front seats and steering wheel, remote engine start, Infiniti InTouch Navigation with Lane Guidance and 3D building graphics, Infiniti InTouch Services with voice recognition for navigation functions, including one-shot voice destination entry and SiriusXM Traffic with four-year complimentary trial access to real-time traffic information. Usually offered as part of the ProASSIST Package, the Q50 Signature Edition also comes with a suite of safety features as standard including Blind Spot Warning, Around View Mirror with Moving Object Detection, front and rear sonar system, Rear Cross Traffic Alert and Backup Collision Intervention. Powering the limited-edition sedan is a 3.0-liter twin-turbo V6 engine producing 300 horsepower paired with a seven-speed automatic transmission. Five colors will be available: Black Obsidian, Graphite Shadow, Liquid Platinum, Pure White and Iridium Blue. 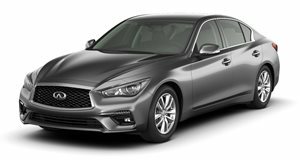 Production of the 2019 Infiniti Q50 Signature Edition will be limited, with sales starting in May 2019. Also on display alongside the Q50 Signature Edition will be the stunning Infiniti Q Inspiration concept previewing a new generation of electric Infiniti sedans. That’s not to be confused with the recently-unveiled Qs Inspiration Concept previews the new design language for future Infiniti sports sedans, which will debut in Shanghai next week. In addition to the Q50 Signature Edition and the Q Inspiration concept, Infiniti will also showcase its entire current model range at the New York Auto Show.